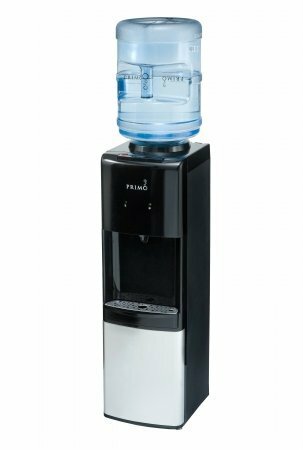 Hot and Cold– This water cooler from Primo comes with an improved 2.0 compressor and cooling system which gives you chilling cold and piping hot water through out the day. Energy Saver– The dispenser comes with UL certification and is energy star rated. It consumes 25% less electricity as compared to older(traditional) water dispenser models. Stainless Steel water reservoir– This water dispenser is equipped with stainless steel reservoir with separate storage area for cold and hot water. Having a premium quality water tank like this ensures that water remains safe for drinking. Stainless Drip Tray– The drip tray is made up of stainless steel which simplifies the job of cleaning to the next level. The primo 6010187 dispenses the hot and cold water at your fingertips throughout the day in a very convenient manner. Once you have a dispenser like this, you will enjoy making those perfectly chilled supper drinks, those hot teas and coffee without making much effort. The dispenser comes with a durable design and is sure to last for few years without giving any problems. The leak guard and universal probe help in reducing the chances of any spillage when trying to load heavy bottles in to the unit. The drip tray is made up of stainless steel makes it easier to clean the spilled water (droplets) very easy. The led lights not only help you see the dispenser in dim light, but also improves the overall aesthetic appearance of the dispenser. This primo hot ‘n’ cold water dispenser comes with a child safety latch, which prevents children from using the dispenser without any supervision. The water tanks come with a cooling capacity of 54 fl. oz. and Heating capacity of 34 fl. oz. It is a free standing unit and can be easily fitted to any corner of your kitchen, mini bar, garden or even in your office. The dispenser is styled in black color and fits very well with any type of surrounding decor. Because of the level of convenience the water cooler and dispensers offer, people tend to increase their water intertake and get less inclined towards intake of carbonated drinks, tea and coffee. It makes instant hot water available which is convenient to make instant tea or oat meal, you also get good tasting cold water by mere press of a button. Infact once you will have a dispenser like this at your home or office, you will find it difficult to live without it. You can soon observe a considerable increase in amount of water you drink once you have this unit around. On the downside, the hot water is good enough for quick drinks like hot chocolate but not good enough for tea, coffee or instant noodles. Even the cold water is not quiet cold, it is just slightly cooler than the room temperature. The water stream is slow and some improvement is required to increase the water flow so that water glasses can be filled instantly.